Amazon Kindle Fire 2 landing just in time for Christmas? Online retail giant Amazon is readying its Kindle Fire 2 tablet for the festive period and it could sport a larger 8.9-inch display. If you're already thinking about Christmas then firstly, shame on you, but secondly, Amazon may have the answer to your gift-giving conundrums. The news comes via a Reuters source, who claims "Amazon plans to launch a new tablet closer to the holiday season later this year". About to set the tablet market alight? It's been suggested that the increase in screen size is an attempt by Amazon to challenge Apple's 9.7-inch iPad range, which currently dominates the market. 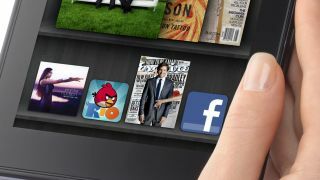 However the Amazon Kindle Fire offers a simple, budget option for those US consumers unable to stump up the cash for the extravagant new iPad or even the iPad 2. The Kindle Fire 2 is expected to make the dash across the pond and land in the UK and the rest of Europe, with hopefully the same low price tag, as Amazon looks to take on the worldwide market. Find out all the information about Amazon's next tablet in our Amazon Kindle Fire 2 release date, news and rumours article, or take a look at the video below.